Whether it’s your family coming for Christmas, or you have invited your friends over for dinner, you have to clean your home. However, it doesn’t have to be as time consuming as you think, especially if you put into action these professional maid house cleaning tips. It’s always better to prevent than to clean up afterwards, right? Well, we rarely think about soap as an agent of staining. However, tallow-based traditional soaps leave gummy, white stains of the walls of your shower or bath. On the other hand, if you opt for glycerin soaps or those made from vegetable oil, your shower will be stain free, as these types of soap rinse cleaner and don’t leave residue. And not just the phone. Try to eliminate all distractions while doing the cleaning. Even the maid house cleaning professionals know how easy it is to get distracted, so try to avoid it. Don’t check Facebook updates or Viber chats. Concentrate on what you’re doing and you’ll need significantly less time. Turn off the TV as well, so as not to get carried away by your favorite TV program. In the beginning at least. Start with the simpler tasks. Tackle the low-traffic rooms first, as you will finish them quickly and efficiently, becoming motivated for the bigger tasks. So, never clean the bathroom first, as it can often have the negative effect of exhausting you before the rest of the work. Start with the dining room or the living room, and go from there. Maid house cleaning professional list the dishwasher hack as one of the lifesavers when it comes to cleaning your home. Don’t look at it as a place for your dishes only. Use your dishwasher to clean the dish drain, or the toothbrush holder. Anything made from hard plastic, metal, glass or ceramic can go into the dishwasher and be clean in a jiffy. Having a squeegee in your bathroom is an easy way to reduce the frequency of thorough bathroom cleaning. Simply use it to wipe the tub sides, bathroom walls, or even the floor after a shower or a bath. This will help wash away shampoo or soap residue, rather than letting it evaporate, leaving a film in the bathroom. Who knows, if you become efficient with a squeegee, you might have to clean the shower only once a month. Whatever type of vacuum you own – upright, bagged, canister or bagless, you have to keep it properly maintained in order to get the most out of it. Maid house cleaning pros say that a good vacuum cleaner significantly reduces the tidying up duration. In order for your vacuum cleaner to maintain maximum suction, tinker with it every month. Wipe the bottom and the inside of the machine, change bags, and clean the rotating brush. Leave the yearly service to the professionals though. 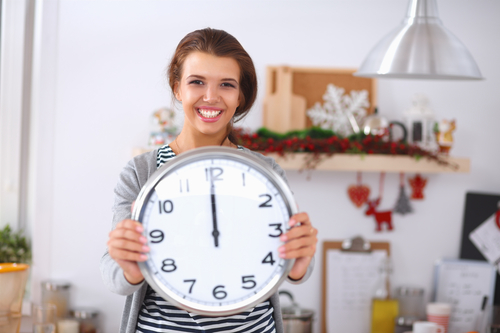 This may be considered cheating, but if you’re pressed for time, it may be wise to skip the rooms rarely used. As there are those chores you will certainly do daily, such as wiping the counter after lunch, there are some rooms that can be cleaned monthly. A guest bedroom is one of the rooms you don’t have to pay close attention to during regular weekly clean-ups. Just be mindful of excess clutter and you’re good. Focus on those parts of your home you frequently spend time in, and make them shine. For the tougher tasks and lack of time, professional maid house cleaning service is here! If there are some house chores you simply don’t like doing, or some that demand more time you simply don’t have, professionals are here to help. DeluxeMaid offers the best cleaning services for your every need, so feel free to call us today!